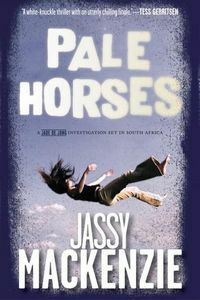 Pale Horses by Jassy Mackenzie: Synopsis and Online Purchase Options. Synopsis (from the publisher): Johannesburg, South Africa: At first, the case appears to be one of simple misadventure. Sonet Meintjies, a base jumper, falls to her death while attempting to parachute off a newly built sixty-five-story skyscraper. But Sonet's jumping partner insists that this was no accident, and he hires private investigator Jade de Jong to uncover the truth. Jade discovers that Sonet worked for a charity that helped impoverished communities become self-supporting farming units. When Jade travels out to the community farm in Limpopo, she finds it not just abandoned but razed to the ground. Digging deeper for answers about where the residents went, Jade learns about a fatal but unidentified disease that swept through the entire community. A deadly harvest has been gathered, and the person who knows the real truth about it has been forced to become collateral in its trade.